"In the Mind's Eye brings out the special problems of people with dyslexia, but also their strengths, which are so often overlooked . . . . It stands alongside Howard Gardner's Frames of Mind as a testament to the range of human talent and possibility." --Oliver Sacks, M.D. "Unfortunately, I did not discover this wonderful book beforre I wrote Thinking in Pictures....I recommend it to teachers, parents, and education policy-makers. West profiles people with dyslexia who are visual thinkers, and his conclusions on the link between visual thinking and creativity are similar to mine." This inspiring book profiles gifted individuals who used nontraditional methods in their work as it explodes many myths about conventional intelligence and charts new vistas for today's computer visualization technologies. Some of our most original intellects--Albert Einstein, Thomas Edison, Lewis Carroll, and Winston Churchill--relied heavily on visual modes of thought, processing information in terms of images instead of words or numbers. Thomas G. West examines the learning difficulties experienced by both famous and everyday people, and he explores how recent neurological research shows an association between visual talents and verbal difficulties. In the Mind's Eye probes new data on dyslexics to see how computers enhance the creative potential of visual thinkers, as well as interactive computer applications at all levels of education and work. Updated with a new preface, epilogue, and expanded notes, this volume could be the clarion call for educators and corporations to mine this untapped resource of highly creative talent in our midst. 9. 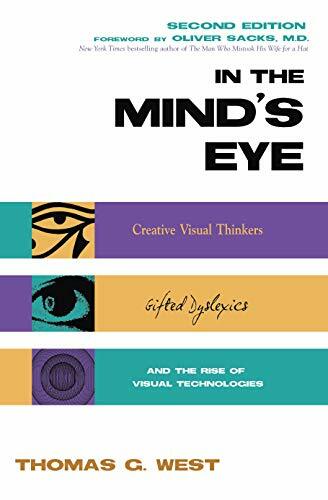 In the Mind's Eye: Visual Thinkers, Gifted People With Dyslexia and Other Learning Difficulties, Computer Images and the Ironies of Creativity West, Thomas G.
10. In the Mind's Eye: Visual Thinkers, Gifted People With Dyslexia and Other Learning Difficulties, Computer Images and the Ironies of Creativity [Hardcover] West, Thomas G.